A corresponding licence and thus the existence of a valid identification with a username and password for the Saferpay system. A valid acceptance agreement for BillPay must be present. The address of the purchaser is present and is forwarded to BillPay. Attention: For BillPay activation on the Saferpay terminal, please inform our activation service cs.ecom@six-payment-services.com about your BillPay credentials and the desired currency. Before they can conclude a transaction via BillPay, all BillPay customers have to be entered into a so-called “Certification Provider”. Prior to the going-live, BillPay expects each merchant to trigger a transaction via this provider. As proof, BillPay requires a complete invoice from the merchant system. After examination, information on the live account data is provided. In contracts for BillPay Purchase on Receipt and BillPay Direct Debit, the operation must be performed for each payment method. If address data have already been captured in the shop, they can be forwarded to Saferpay via the corresponding parameter. Note: Request with address forwarding. See the Payer => DeliveryAddress container. Important: DeliveryAddress must be used! "PaymentMethods": ["DIRECTDEBIT"], //Use "INVOICE" for Purchase on Receipt! Alternatively, an address form, in which the customer must enter their address details, can be displayed in the Saferpay Payment Page. Make sure that all the address details needed for BillPay payment are requested in the address form. Note: Request for form usage. See the DeliveryAddressForm container. Important: DeliveryAddressForm must be used! "PaymentMethods": ["INVOICE"], //Use "DIRECTDEBIT" for Direct Debit! With Payment Page Assert, all the necessary information is sent back to the merchant. This includes the transfer of purchase-on-invoice credit transfer data that must be forwarded to the buyer. "Name": "Billpay Purchase on Receipt certification"
Like other means of payment, BillPay transactions must also be booked. For this booking, use the Transaction Capture method. If you have agreed upon the due dates of payments with BillPay, the due date of payment can be delayed in Capture Request with DelayInDays. Note: Example for Capture Request. For this, see the Billpay container. Some of the key information, such as the invoice data, are returned by Saferpay via Capture. Because it is not always possible to conduct certification in every shop without interrupting live operations, Saferpay Backoffice offers the option of creating a payment URL for a BillPay test payment via the Payment Page. This can be used to perform the acceptance test. Attention: Because this is not loaded via the shop, the shop is not informed about the purchase. It is therefore necessary to manually create the invoice required by BillPay. 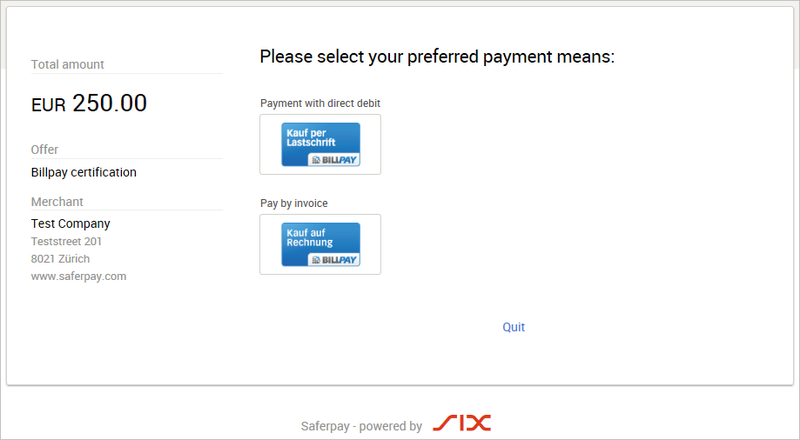 You can find the necessary data for this in the Saferpay Backoffice via Transactions > Journal. Here you can find a list of all transactions, which you can then view in detail. Fill out the fields for the description and the amount and, if necessary, select the currency and add the return addresses for your webshop. Then click on “Save”. Attention: Make sure that the checkbox marked “Caution: only use for test transactions!” has been ticked. 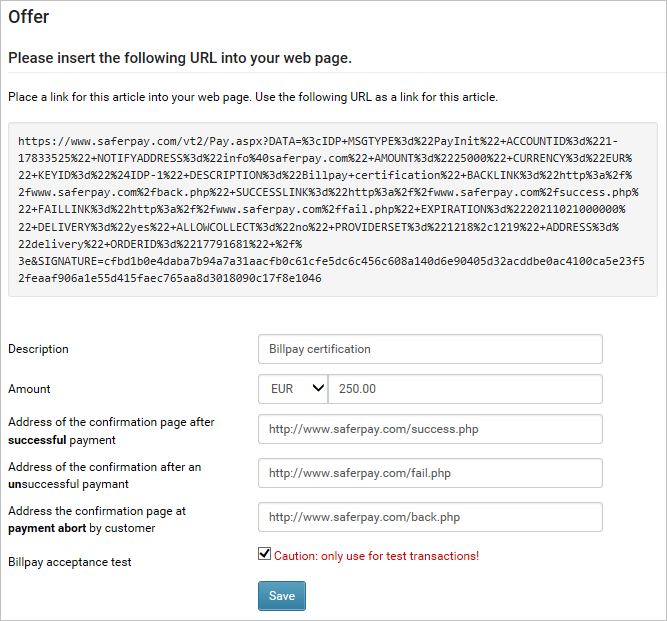 When creating an acceptance invoice, ensure that the test URL created contains a random OrderId allocated by Saferpay. When using a test URL, the customer address must be entered manually in the Payment Page.